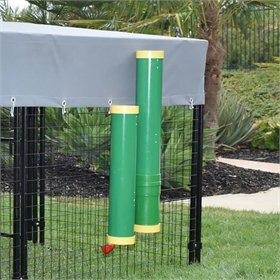 This new, high-end automatic poultry drinker reduces watering headaches with its clever design. 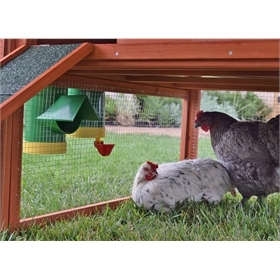 Because it mounts on walls or fences inside (or outside) your coop, the waterer is kept elevated out of reach of pests that can contaminate your chickens' water. 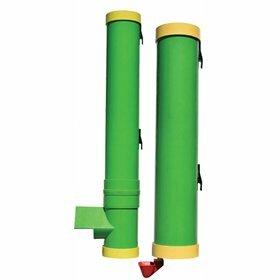 The waterer holds 2 gallons and is easily fillable from outside the coop or run, when utilizing the outside mounting system. 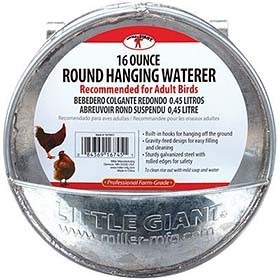 We recommend one waterer for every 4 - 5 chickens in your flock. 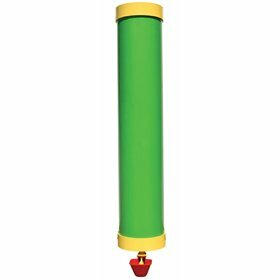 "Our outside fill waterer is designed so that water does not sit in the cup, but that the cup fills when the chicken pecks at the "tapper" (yellow part). 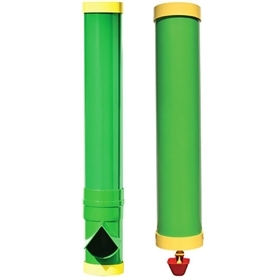 If you press on it, with water in the tube portion, it should release it into the cup. " 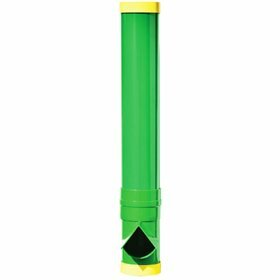 Dimensions: 4" x 4" x 25"
NOTE: The waterer is made of extruded and molded food grade PVC. Because it is colored all the way though, that means there is no paint to scratch off.